CBOT markets continued their reign of fire in the Sunday night trade as corn, beans wheat made moves back to recent highs or even above them. For the first time in over a year, front month September corn has(d) a 4 handle in front of it. The forecasts below are driving the price action right now, but there is chance for the USDA to add fuel to the fire with the crop progress reports tonight and then WASDE on Wednesday. The week ahead will also have Janet Yellen giving testimony to congress on how the economy is progressing with 2017 half way in the books. The dollar has been consolidating of late within its recent down trend. If she would be dovish and the dollar downtrend would continue we could see tail winds for grain from there as well. Regardless of the schedule though, this rally is about the weather. The market continues to add weather premium to price as the dire drought the Dakota,Montana and parts of Canada spreads southeast with pollination beginning. It is raining really hard in Chicago right now, and Central Illinois and Indiana should see it as well. This looks to be the best chances at moisture for many in the coming weeks. Historically, once a weather pattern is established in June and lasts into mid July, it normally stays in tact through July. End users are realizing the mountains of grain out west may be their best chance at cheap corn for the next year and we finally seeing a push in the spreads.Like I mentioned above, Sep corn is right at 4.00, a place where many with old crop had orders and Nov beans are pushing on the highs from February. The net spec position of both markets represents a lot of fuel to push the markets higher. Especially in soybeans. It scares me how much I like buying soybeans right now. 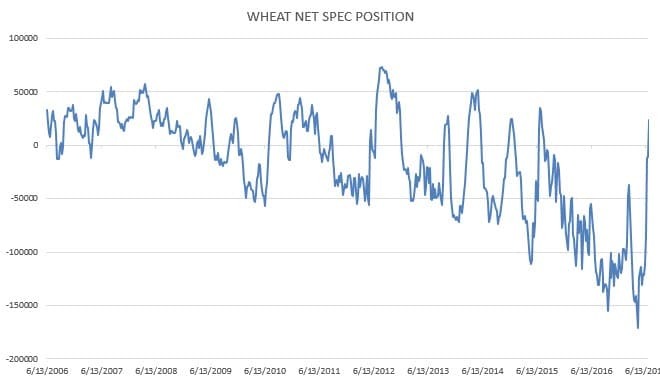 Wheat COT reports show a pretty long spec position now, which has me somewhat confused with the really in KC wheat this morning. I would think corn and beans would play catch up on wheat for the time being, but we are seeing the opposite. Wheat is extending is lead on corn. 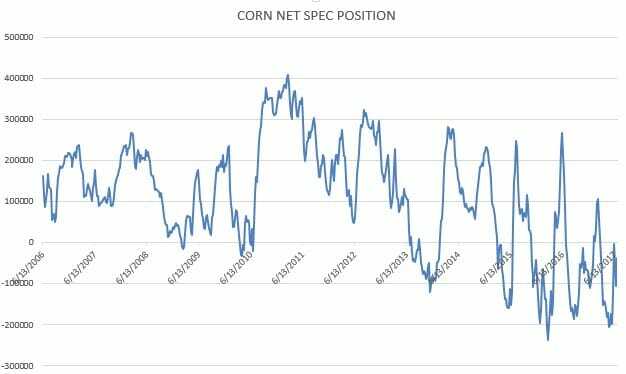 I think it probably has to do with sell orders in from producers as Sep hit 4.00, if I’m right we should see that spread tighten if corn would come back. It could have something to do with Egypt purchasing 115,000 MTs of Russian wheat on Saturday paying an average of $5.67 per bushel, above its most recent tender and confirming rising world prices. Lastly cotton…December is languishing just below 69 cents but Oct futures (they thinly trade) are starting to move. Exports in recent weeks have been on fire again, i think cotton looks pretty good here in the 68 cent area for a shot to buy but I think you need to be able to hold a move back into the 66 area. If you can’t, wait for that break. Otherwise I think we have a run back into the 70’s in the cards rather soon. Weather is Texas is the key and we are expecting a dry out which may be good, given the lack of hail that will come with that. But in the meantime we will watch Texas weather in the conditions reports for more direction. 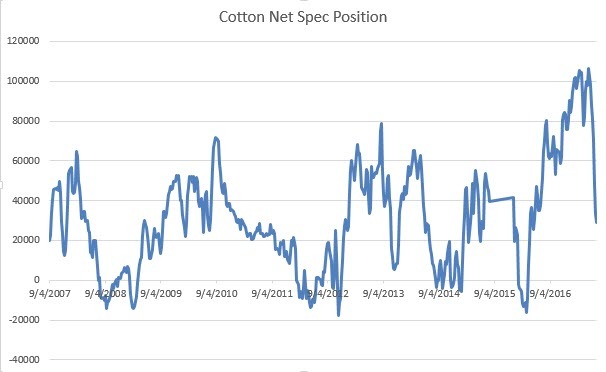 COT reports show the cotton position has been heavily liquidated over the last 6 weeks but there is more to go if you believe we head back to those lows. 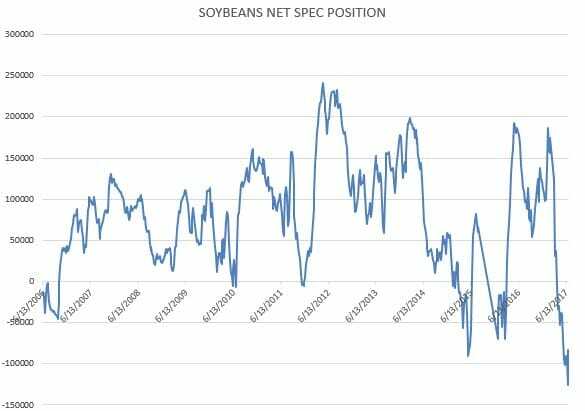 I do not think (given the weather, export pace and the outside grain markets) spec money is in a hurry to short right now. Call me if you have any questions. Stay long corn, beans (Id look at buying more) and look at buying cotton on breaks into the WASDE. I would be looking to hedge July 18 KC wheat on moves into the mid 6’s.